Does the shoe really fit? As a parent, it’s natural to worry about your child’s health. Children’s teeth, eyes, ears, and most other body parts are examined regularly as they mature. However, the normal developing foot often goes unnoticed as typical signs and symptoms won’t arise until adulthood. Wearing the wrong footwear can result in hammer toes, ingrown nails, foot corns, calluses, and bunions. Heavy shoes with poor support can also alter a child’s natural gait and muscle development, resulting in general foot fatigue, flat feet, and soft tissue complications. By improving a child’s footwear, risk of common foot disorders can be minimized to prevent associated pain and discomfort. At any age, the most important thing to look for when buying shoes is fit. Children’s feet are very malleable with a lot of fatty padding. Therefore, they can adapt easily and will rarely complain about scrunched toes or areas under a lot of shoe pressure. It is more likely that a child will avoid wearing shoes, prefer to be carried, or trip regularly if they are having difficulties with their feet. Ideally, kids should have their feet measured every three months to ensure they are wearing the correct size. This means there is at least a thumb width (1”) between the end of the shoe and their longest toe when standing. In general, the foot will grow a half size every 2-3 months for children 16-24 months old, every 4 months for 2-3 year olds, and every 4-6 months for those over 3 years old. Make sure the general shape and function of the shoe is similar to the shape and function of the child’s foot. Typically, children have wide, straight feet so the sole, or last, of a shoe should not be overly curved. Avoid buying shoes in the morning, as feet will be their longest and widest at the end of the day. The less the foot slides or lifts in a shoe the better. Velcro, laces or buckles along with a firm heel counter at the back will keep the heel in place and help stabilize the foot without having too tight of a fit. The sole should only bend at the ball of the foot where the foot flexes, not in the arch. Toe boxes should be round, wide, and deep to give the toes room to move. Because children are so active, their feet need good airflow. Shoes made from leather or canvas material will have better breathability then a synthetic or plastic material. Fungus thrives in warm, dark, moist environments, so good airflow can help prevent athlete’s foot from developing. It is important to remember that shoes should not need to be “broken in”. If they do, they are either poorly designed or poorly fitted. Similarly, avoid buying shoes that are too big in hopes that the child will grow into them. This requires a greater muscle action that results in muscle fatigue and strain. Due to foot structure, biomechanics, gait patterns, and activity type, different areas of the shoe will break down differently with each individual and change the overall structural properties of the shoe. 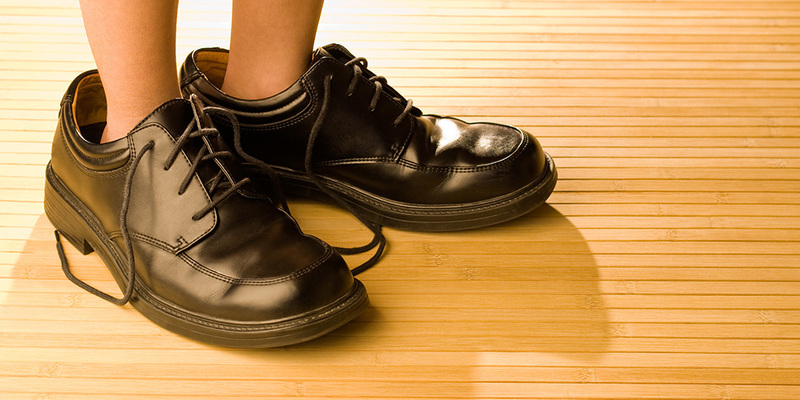 Avoid wearing worn out or hand me down shoes as they can place the foot into an abnormal position. Remember, prevention is always easier and cheaper than treatment!